This program sets up a game in which participants are given attacker or defender roles, with multiple target locations. Coordinated attacks are generally more effective, but communication opportunities (if permitted) run a risk of being monitored. You specify attack costs, defense costs, and values for various outcome scenarios. 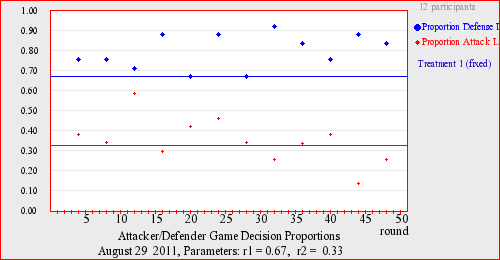 The class defaults implement a simple profiling game, in which the equilibrium (randomized) attack and defense profiles tend to be "misaligned". The game can be used to test behavior against theoretical (mixed Nash) predictions, which tend to work fairly well for the simple game implemented by the class defaults.